Macadamia nut recipes have become a universal icon among enjoyable snacks foods. People have used them in cookies, chocolate confections, brittle, and breads to name a few. It’s hard to imagine how just one little nut can be used in so many different recipes. But for those that know, the recipes barely even scratch the surface to the multifaceted benefits of this nut. And these days macadamia nut oil is becoming just as sought after as the nut itself. The macadamia oil has similar characteristics that are found in other types of vegetable oils. However, it does have a chemical structure far superior to those other oils. And it certainly differs from any other types of nuts. The chemical make up of this macadamia nut oil is loaded with healthy attributes. It is comprised of over a whopping 83 percent monounsaturated fatty acid. Another roughly 12 percent is made up of saturated fatty acids; and 4 percent of polyunsaturated fatty acid. The macadamia oil also has an odd but healthy ratio of omega-3 fatty acids to the omega-6 fatty acids. The former has far more benefits to the body than the latter. With a higher ratio of the omega 3 fatty acids the macadamia nut oil has set the bar high on all other cooking oils that often have a higher ratio of the omega 6 fatty acid. Other oils that contain omega-3 (fish oil) and omega-6 fatty acids are flaxseed oil, emu oil. The macadamia nut oil has a bit of a honey color to it, or a really soft yellow hue. The translucent liquid has a distinct but inviting nutty aroma. It can be cultivated into preferences of both color and smell however. The oil remains in a liquid form at room temperature, and has a fairly long shelf life. Strong comparisons have even been made towards butter due to its highly resilient smoke point. The smoke point is where the oil begins to lose its flavor and nutritional values. The macadamia oil can keep its medium up to roughly 410 degrees Fahrenheit (210° C). While it is somewhat low on protein, it does host the most monounsaturated fat of any other plant oil. Some people at first glance may think this is a bad thing. Most are taught to stay away from fatty foods. But the type of fat makes a huge difference between a healthy diet and an unhealthy one. The macadamia nut oil is chocked full of the healthier fatty acid, and can actually produce lower triglyceride levels as well as lower cholesterol. And as mentioned above, due to substantial omega 3 fatty acids found in this macadamia oil, it has other nutritional values as well. One of its biggest benefits is keeping cell walls clean. This can help the consumer lower the risks associated with high blood pressure and even heart disease. 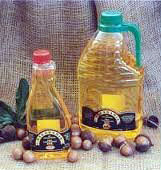 The macadamia oil is used in a variety of foods. The oil adds nutritional value stemming from its chemical make up, and of course gives the dishes a great nutty flavor to boot. Perhaps, the most common of uses is found in salads, much like an olive oil type of dressing. Due to its high tolerance to heat, many others have found it an incredible alternative to butter and use it on their breads or for a dipping sauce. Maybe the best way to use the macadamia nut oil in the kitchen is by flavoring many different foods. This multifaceted oil can also be used for frying much of the Australian cuisine. It’s a fantastic alternative to vegetable oils like Canola oil or olive oil. When it comes to cooking with the oil, it’s like having the best of all worlds. Not only is it healthier to cook with than the other oils, but it still offers that smooth nutty flavor that is also superior to other tasteless cooking oils. Undoubtedly, the biggest trend growing out of this macadamia oil industry is its commercial use now in beauty products and cosmetics. It didn’t take long for people to figure out that this healthy macadamia oil might also be beneficial to the skin. And they were right. With good sources of nutrition including calcium, vitamins, and phosphorus the already versatile oil tackles several skin and hair ailments head on. Another unique thing about the macadamia nut oil is the high levels of palmitoleic acid (omega-7) it carries. In fact it’s the highest levels of any other plant. With age, people need this palmitoleic acid readily to keep a smooth soft skin free of wrinkles. For this reason the macadamia nut oil, or macadamia oil based products, have become increasingly popular as an anti-aging remedy. It won’t leave the skin too greasy either like olive oil does. This can even lead to acne breakouts if they use too much of that olive oil. To use it on wrinkles, all the person has to do is apply the oil directly on the desired areas. Alternatively, they could find a cream with other natural oils and vitamins to work in harmony with the macadamia oil. It’s important to stay away from too many hyped ingredients, as the most basic ones will actually do wonders working with the oil. Probably the most relaxing of all uses of macadamia nut oil is during massages. Many professional massage therapists have incorporated the oil into their techniques and use it often as an aromatherapy treatment. The skin absorbs the oil, instead of it having to break through and force its way into the epidermal to provide the benefits. 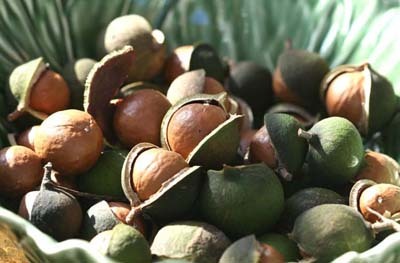 The macadamia nut oil has found its way into bath products for much of the same reasons. Skin needs to keep certain moisture mediums. It is also healthiest with a layer of natural oil on it. The problem is with most cleaners out there, they do too much. Because of this, they strip away protective natural oils from the skin as well. This can lead too much of the irritable skin and dryness people often feel. For this type of use, the oil works well in combination with Virgin Coconut Oil. A quick Google search for the two ingredients should pull up results. Tip: Organic would be the most beneficial way to go for those interested in using it for a cleanser. The oil has several natural healing properties as well. Many native Hawaiians would often use the macadamia oil to cure and soothe their sunburns. Others are finding great success using it to help with irritated skin, small wounds, and to reduce the coloration in scars. Unlike other moisturizers that have manufactured properties injected into them, the macadamia oil is all natural. Cold pressed macadamia nut oil should turn up results online for the best products to use for these healing purposes. The natural oil has even found its way into healthier hair. The same reasons that make it a success with dry skin are also doing wonders for moisturizing the scalp. The hair itself gets stronger and the oil won’t fry it out. People with all coarse hair are having good results with it not only strengthening but also giving the hair a fuller healthy shine stemming from the natural oils. Again, it’s many of the same properties that are making it a great product all the way through, are also the reasons for its success as a healthy hair shampoo. Here a search for macadamia oil shampoos should turn up a plethora of results. As mentioned before, organic stripped down versions of the oil are best. Using less of the unknown chemicals and more vitamins in the shampoo, will ensure a great product for great hair. With so many nutritional benefits and uses for this nut, it’s no wonder aborigines of Queensland and New South Wales have been eating this fruit for thousands of years now. Its high concentration in monounsaturated fatty acids sets it apart from any other types of nuts, and provides an essential nutrition to the diet. The benefits of the macadamia oil and the macadamia nuts themselves to lower cholesterol and risks of heart disease often surprise people. And now the fact that it can aid people in so many ways on the outside as well might even be stranger. The macadamia oil can now be used for medicinal purposes to combat dry skin, sunburns, and even restores youthful looks fighting wrinkles. The oils and nuts are easy to store. And of course they make some of the most delicious treats out there today. Hi I looking over the internet to find out how to make macadamia oil I have a big tree and so many nuts. It’s good. It also contains Omega 3 and 6. Great article!!! Copyright © 2011-2019. Macadamia Oil. All Rights Reserved.